Today is our March blowout that happens almost every year. We have a good blowy snowy storm, everything comes to a standstill, and we're all surprised that this happened. As a rule, March snow doesn't last all that long as our temperatures climb to the above freezing level. This is about loss of innocence. This is about how life can play the worst kind of tricks on you before you understand what's going on. My energy level x the weight of my laptop x wind velocity. Add this to number of blocks I have to walk to the metro. 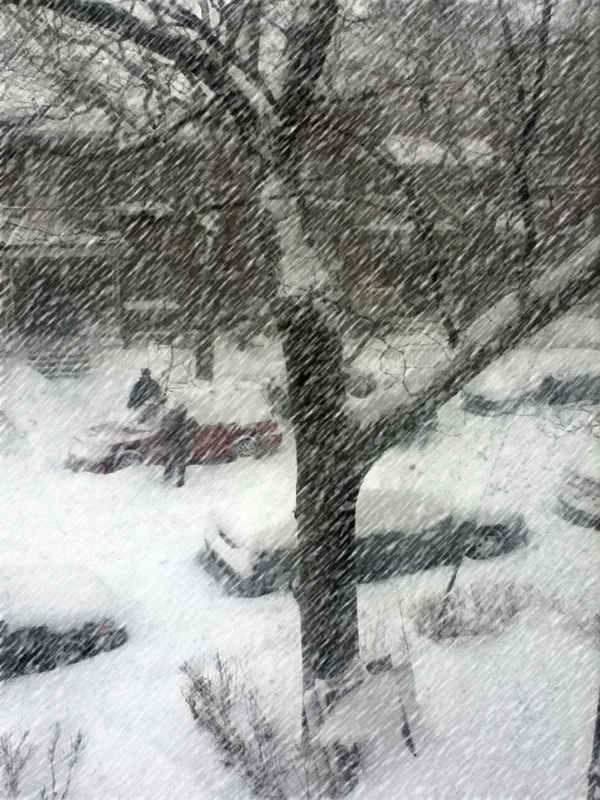 Take the square root of subtotal, add expected number of inches of snow, and voila. The answer comes to "stay home today". I confess I had to do this several times to get the answer I wanted. While listening to the radio announce the school closures I was reminded of what a great event a storm was when I was a kid. Storm day! What could be better? Yes, it was too bad outside to go to school. No, it wasn't too bad outside to meet your friends, build a snow fort or snowman, or go tobogganing down the nearest snow bank. It was better than scheduled holidays because it was a free day! This didn't just apply to kids. Teenagers, adults - we all got a free day when there was nothing we could do except stay close to home, hopefully have some fun, and wait for the snow to stop. (As teenagers my friend Laura and I were particularly keen on snow days - junk food, soap operas - we loved it)! But today, while listening to the announcer, I was shocked to hear him say "....you must attend on line classes". Whoa! Back it up! This can't be happening! On line classes? What about snowmen? What about going out with friends? What about a bonus day just for living in this climate? This is just another example of technology gone amok. This can't be a good thing! When a fabulous snow day becomes a day stuck in front of a monitor, well, I give up.